MANCHESTER, N.H. - As it played out on TV this week, Sarah Palins One Nation road trip of U.S. historical sites was a masterpiece of political mischief-making  a wild dash up the East Coast that delighted her fans and cornered the market on 2012 coverage for days on end. Thats not how the bus tour looked to Republicans on the ground, many of whom are more convinced than ever that the former Alaska governor is simply not serious about running for president. While Palin has reveled in giving an extended one-fingered salute to the national press, refusing to give out details about her travel schedule and forcing reporters to literally chase her vehicle up I-95 in order to cover her, she reached out to precious few activists and party leaders in the states she visited. And the locals have noticed, leaving them scratching their heads and looking for a rationale for a candidacy. But she needs to show that she can go beyond that, and this tour doesnt accomplish that, said King, who is urging Rudy Giuliani to enter the 2012 race. Anything she does to leave the GOP and the MSM cold, probably makes me smile. 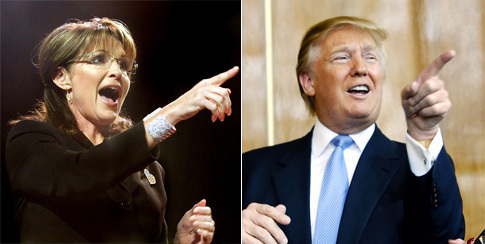 The usual suspects in the republican party are whining that Palin isn’t following their script. What a shocker! More proof that there needs to be plenty more purging of rinos. She doesn’t give a rat’s a@@ about “The Party”. I like Ryan; however, Im not settled on any candidate yet. Thats partly because I have this recurring nightmare that the eventual nominee will be Lindsey Graham, just because thats the way the Republicans roll. Guess I’m not “on the ground” then. I loved it. Really. The woman could come out and have pancakes for breakfast and these pissy little ! @(#*s would write an article that she’s setting a bad nutrition example for kids, proving once and for all that she should never even remotely be considered for President. Tell you what... if she runs, for the first time in my life, I’m going to sign up to help any way I can. Because she won’t be running against Obama alone  she’ll be running against Obama, every media outlet (except talk radio) and many members of her own party. Why are these people trying to hold this tour to that of a presidential election campaign? Why are they complaining that it does not show that Palin is serious about running when she has never said she is running? Goofy. And smells of sour grapes. The old game is over. Get used to it. It’s the party that is going to have to adapt, not the other way around. Palin has repeatedly said this tour is not a campaign swing and she does not intend to work it that way. So, of course, she is not spending her time reaching out to local party officials and so on. Does that mean that she wouldn’t recognize the need to actually, um, CAMPAIGN if she were in fact CAMPAIGNING for President in the future? "Pennsylvania Republican Party Chairman Rob Gleason,"
Gleason is the reason we have Critz in Murtha's old district. Gleason is the reason we have idiot Casey as our Senator. I will never contribute to Pennsylvania Republicans as long as Gleason is the Chairman. Gleason??? Gleason??? It is to laugh. The GOP just doesn’t get it. “Same old” isn’t going to cut it this time around. Aside from the MSM propaganda ministry, the GOP is the second biggest problem in the country next to that “other” party. It becomes more clear every day that the GOP does not believe that. Politico is disrespectful of Gov. Palin. have been involved in spreading anti-Palin spin to reporters, seeking to diminish her standing after the election. 'The only serious candidate ready to challenge to lead the Republican Party is Mitt Romney. "Some former Romney aides were behind the recent leaks to media, including CNN, that Governor Sarah Palin was a 'diva' and was going off message intentionally." the claim of a major internal strife between close McCain aides and the folks handling his running mate Sarah Palin." "Im told by very good sources that this was indeed the case and that a rift had developed, but it was between Palins people and the staffers brought on from the failed presidential campaign of former Gov. Mitt Romney, not McCain aides." "The sources said nearly 80 percent of Romneys former staff was absorbed by McCain and these individuals were responsible for what amounts to a premeditated, last-minute sabotage of Palin." that Palin would be a serious contender for the Republican nomination in 2012 or 2016, which made her a threat to another presidential quest by Romney. .hoping it would ingratiate themselves with Mitt Romney." He musta slept through 2008 then. He is the most deliberately inneffective rino on G-d’s green earth in PA.
‘career’ politicians HAVE TO GO! I don’t care what party they belong to! If King does not understand how breathtakingly provincial a candidate Giuliani is, his opinion is all but worthless.